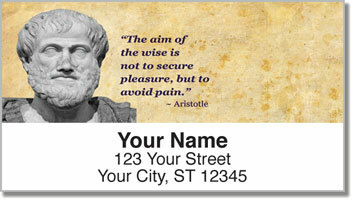 Wax philosophic with Greek Philosopher Address Labels from CheckAdvantage. 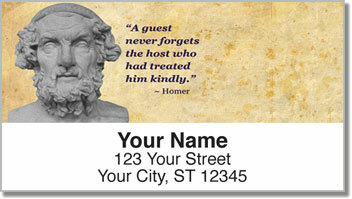 We created these unique personalized labels to honor the wisdom of the ancients. 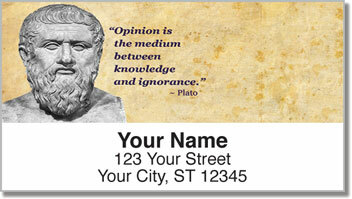 You'll find Plato, Aristotle, Socrates and Homer represented in this unique collection. The background of stained parchment gives this design an antiquated, weathered look that's perfect for the subjects at hand. While these personalized labels will look terrific on your packages and envelopes, you'll also find them useful for identifying books and other items as belonging to you. So go ahead-take yourself back to the Ivory Tower, when you didn't care that the study of Greek philosophy wasn't going to help you get a job! 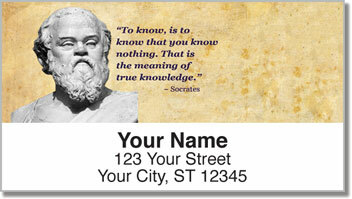 Make Greek Philosopher Address Labels and matching Greek Philosopher Personal Checks yours today!